In The World Without Us, Alan Weisman offers an utterly original approach to questions of humanity’s impact on the planet: he asks us to envision our Earth, without us. In this far-reaching narrative, now translated into 34 languages, Weisman explains how our massive infrastructure would collapse and finally vanish without human presence; what of our everyday stuff may become immortalized as fossils; how copper pipes and wiring would be crushed into mere seams of reddish rock; why some of our earliest buildings might be the last architecture left; and how plastic, bronze sculpture, radio waves, and some man-made molecules may be our most lasting gifts to the universe. 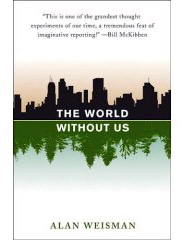 The World Without Us (Thomas Dunne Books/St. Martin’s Press, 2007) reveals how, just days after humans disappear, floods in New York’s subways would start eroding the city’s foundations, and how, as the world’s cities crumble, asphalt jungles give way to real ones. It describes the distinct ways that organic and chemically-treated farms would revert to wild, how billions more birds would flourish, and how cockroaches in unheated cities would perish without us. Drawing on the expertise of engineers, atmospheric scientists, art conservators, zoologists, oil refiners, marine biologists, astrophysicists, religious leaders from rabbis to the Dalai Lama, and paleontologists – who describe a pre-human world inhabited by megafauna like giant sloths that stood taller than mammoths – Weisman illustrates what the planet might be like today, if not for us. From places already devoid of humans (a last fragment of primeval European forest; the Korean DMZ; Chernobyl), Weisman reveals Earth’s tremendous capacity for self-healing. As he shows which human devastations are indelible, and which examples of our highest art and culture would endure longest, Weisman’s narrative ultimately drives toward a radical but persuasive solution that doesn’t depend on our demise. A New York Times bestseller, The World Without Us was rated the number one nonfiction book of 2007 by Time and Entertainment Weekly. It was a finalist for the 2007 National Book Critics Circle Award, winner of a Salon Book Award, and was listed among the best books of the year by Amazon, Barnes and Noble, Kansas City Star, Mother Jones, South Florida Sun-Sentinel, Hudson’s, St. Louis Post-Dispatch, and the St. Paul Pioneer Press.